by Paul B. Downing, Ph.D. If you want to learn about opal, this is the book. It's our favorite book about opal. It clearly describes the many different types of opal in language that is easy to understand. 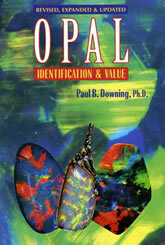 Includes information about how opal is identified, valued, mined, cut and used in jewelry. Explains natural, synthetic, simulant, and assembled stone types. This book is a 6 1/2" x 9 1/4" hardcover with 212 pages. What Makes a Good Opal?